is turning 100 years old in August 2016. He’ll give a presentation on Ritual Jades and talk about his life full of Travel, adventure and learning along the way. Moving to China as a child he learned to paint, talk and learn about the Chinese culture and ancient histories. His ancient jade collection is massive and he always looks to find new pieces. 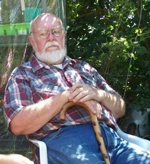 As an appraiser he has been doing antique appraisals for over 70 years. Graduating from Yale University, he has been part of archeology digs, traveled all over the country and currently resides in Redding, CA. He has 7 children, 6 grandchildren and 9 great grandchildren among many others that call him grandpa. For more info on Dr. Carl Vincent visit: Http://www.antiqueappraisalsredding.com or call 530-949- 6691.